As a Vegan of a few years, I have read many books on the subject of Veganism, animal rights, Vegan cooking, and so on. 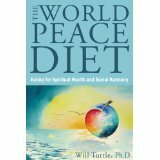 As I was researching reading more interesting books, I came upon The World Peace Diet by Dr. Will Tuttle. I have since had the honor of meeting and talking to Dr. Tuttle on a couple of occasions and was able to measure the man with the extraordinary book he has written. He is indeed everything he preaches and more in his wonderful book. Discussing this book could take a book in itself so I will just mention some of the most important points. I was astonished by the degree of connections Will makes between so many subjects which, on the outset, may not seem related: women’s issues, environmental issues, animals’ issue, history, anthropology, sexuality, the environment, etc… But he brilliantly connects the dots between them all. There is a degree of kindness, love and connection in this book which is impossible NOT to make while reading this book. I can’t help but think of what type of person can read this book and come out of it unchanged. I don’t see how it is possible and would then speak to a high degree of disconnection and maybe hate of the living world if it happens. As a vegan, this is the book I want to give to non-vegans. I actually recommend it when I do vegan outreaches and am at a loss for words on some issues. Instead of arguing with someone, I recommend the book as it is the best speech I can make on behalf of animals. Of course, Will Tuttle goes into details about the various aspects of abuses done to animals but a lot of books do that. This one, however, just goes a lot further. It is not just a detailed description of the abuses, it deconstructs the psychology and perversity of our programming behind these acts. We are all indoctrinated since birth (and beyond aka past lives). As a woman, this book has touched me to the core. The link between the abuse of women and the abuse of female animals (for their milk, eggs) is inescapable and comes from the same mentality which has ruled our world for the last 10,000 years or so. It is what Will calls the « herding » mentality: patriarchal, aggressive, dominating, warlike, exploitative of the natural world, other humans and non-humans. He calls for the rebirth of the « Sophia » principle (named for the goddess) therefore the rebirth of the feminine values of compassion, peace and respect for all beings. There is truly no peace without peace towards all beings. The connection between our wars and what we do to animals is undeniable. The fact that most violent criminals also have a history of animal abuse is a well recognized fact in our society. There is only one way out of reading all this which makes sane sense: The will to free ourselves of our social brainwashing and regain our true selves. Will Tuttle is someone who connects with nature, the spirit and recommends that we do the same with meditation and connection with nature. This allows us to see the interconnectedness of all nature and all beings. When we abuse animals, we also abuse ourselves. When we eat animals, we kill others by contributing to the starvation of other humans on this planet. When we eat animals, we also destroy the earth’s abundance, destroy the Amazon forest, pollute the rivers, contribute to Global Warming (biggest contributor is in fact animal agriculture, per the United Nations and the WorldWatch Institute). We also contribute to the growing poverty of the human spirit which pushes us ever further away from our higher selves. « Personal choice » is no longer a justification for eating animals and their excretions. Doing so is the most selfish thing that can currently be done. And it is also a very unhealthy choice for our bodies. The alternatives to eating animal bodies and excretions have never been so obvious. How hard is it to pick up a good vegan cookbook or browse the internet (thousands of vegan recipes online for free) and try some delicious healthy foods that will totally liberate the planet. This book has answered a lot of my questions, prayers and needs. I could read it over and over again and still find something new to understand or connect. This is how rich I think this book is. Someone said: « There are no valid reasons to eat meat, only excuses ».